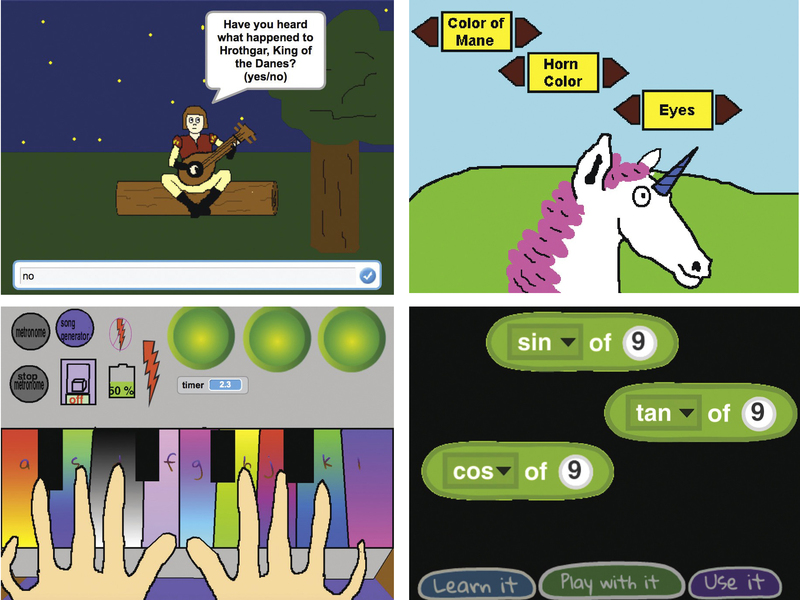 With Scratch, students can code interactive stories, games, and animations. With schools more eager to welcome coding in the classroom, some advocates now push to make it a public-education priority. In her 2014 book Connected Code: Why Children Need to Learn Programming, Yasmin Kafai, Ed.D. ’93, of the University of Pennsylvania, urges schools add on to the traditional “3 Rs” of reading, writing, and arithmetic: the aRts and pRogramming. That the public perceives computers as both essential, and essentially opaque, is a form of illiteracy. Jane Margolis, Ed.D. ’90, senior researcher at UCLA’s Graduate School of Education and Information Studies, argues that this “learned helplessness” has larger implications for equality. Despite the free programming resources available online for learners who know where to look, cultural barriers remain. Perceptions abetted by the hagiography of figures like Mark Zuckerberg ’06 and Bill Gates ’77, LL.D. ’07, inhibit wider participation: that the path to prowess swerves away from institutions like school, and that some individuals naturally gravitate to computer science because they are innately talented and freakishly autodidactic. In reality, the typical boy genius has a great deal of what Margolis calls “preparatory privilege”—if not tech-savvy parents and summer-camp enrichment, then usually a peer group logging on together after school. Margolis has helped write a high-school curriculum, “Exploring Computer Science” (ECS), that intends to expose students to a broad range of topics, including HTML website design, data analysis, robotics, and programming through Scratch. This will be paired with a professional-development course for teachers, who will learn inquiry-based pedagogy along with the content itself. ECS has received the backing of Code.org (the nonprofit behind the nationwide awareness event, Hour of Code), and has been adopted by districts in Los Angeles, Spokane, Chicago, and New York City, among others.